There are so many occasions where poetry would be the perfect gift to give. Now you can make a complete gift by combining your poem with one of our designs. 4. Closing Phrase and Your Name(s) (as seen after poem) - (Examples: With Love, David; All My Love, Katie; Love Always, Mom & Dad; etc." 8. Please type in your poem (do not use all upper case lettering) - This is where you will type in the poem, verse or sincere thoughts you have written. 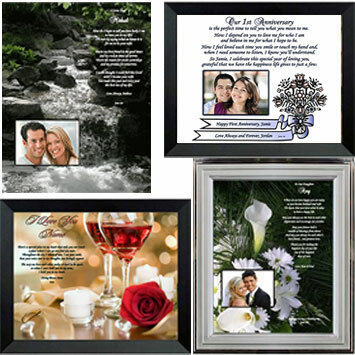 A Poetry Gifts designer will take the lines of type and design it into the Poetry Gift above making sure that it looks its best. Please look at the design in order to determine a suitable poem length. There are no set guidelines; but the longer your poem the smaller the type. If your poem is much longer than the length you see in the photos of your chosen design, the font/type will need to be made smaller to accommodate your entire poem. On the order form, please make sure to type an email address that you check often and phone number in case the designer needs to reach you with any questions. Just wanted to say thank you for your work on the project. It is very nice and I am completely satisfied with the work.